Put-in-Bay, OH – September 6, 2016 – PUT-IN-BAY CONDOS, a luxury condominium community in Put-in-Bay, OH has generated more than $5 million in sales since Fall 2015, outpacing the sales activity in the Ottawa County market and triggering the release of the condominium project’s newest collection of rental inventory sooner than projected. With a target Grand Opening date of July 1st already met, the project is currently on pace to fill all weekend rental slots this season, with an average condo sale price of more than $350,000 for the 26 units being sold and an average weekend rental price of $2,100. The Island Club Home Rentals, a Cleveland-based vacation home rental management company, began accepting reservations for the Condos on January 1st of this year. Cleveland-based Put-in-Bay Synergy LLC (PIBS) acquired the original condo property in 2011. The company’s first release of inventory consisted of 8 condominiums at roughly 4,000 square feet each with rental prices ranging from $900 – $1,800 per weekend. Due to PIBS’s ownership, a stabilized homeowners association and an experienced sales and marketing team, the phase two release of lake view condo inventory is nearly sold out and more than 90 percent of the community is ready to be occupied. To date, better than expected early reservations have been secured for the second release. Jeris says that at the outset of PIBS’s ownership, the community’s biggest hurdles were potential buyers wondering about Put-in-Bay Condos’ stability in the wake of overall market conditions, both in the Lake Erie area and nationally. He says that particular hurdle was quickly overcome and sales were easy to get due to the popularity and location of Put-in-Bay. In fact, many owners at Put-in-Bay Condos are Put-in-Bay-area locals and 15% of the purchased units are planned to be owner occupied. “After exploring their purchase options in a real estate market that many of them know quite well, our buyers chose Put-in-Bay Condos,” adds Jeris. “There is a real community of owners that are also friends here. There is also pride of ownership in a quality project with a well-funded HOA that is evident to our prospective buyers. The stable pricing and stable HOA give buyers an added sense of security,” Jeris says. Put-in-Bay Condos is a new luxury condominium community located 5 minutes from the downtown Put-in-Bay strip in the heart of South Bass Island, OH. It is the most popular of the Lake Erie Islands, renowned for its historic offerings, weekend festivities, parks and trail system, golf cart transportation, and proximity to Cedar Point. 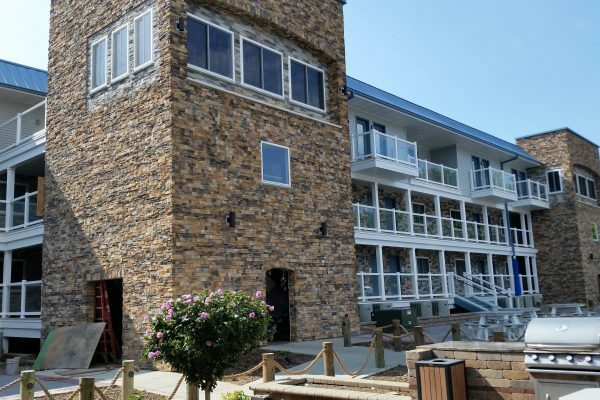 Put-in-Bay Condos overlooks beautiful Lake Erie and each new unit will have breathtaking views of the water from large private decks. 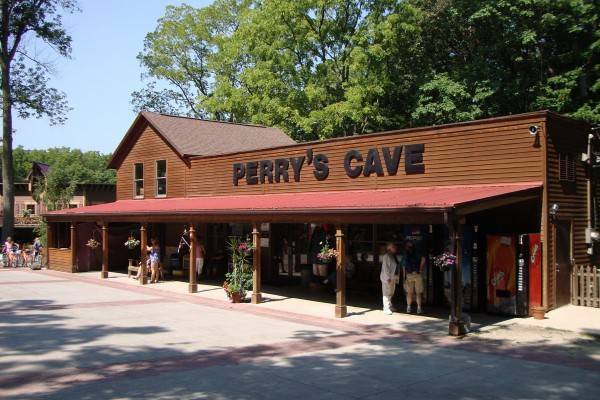 It is located near Port Clinton, between Toledo and Cleveland, and easily accessible from Route 2. The community is comprised of 26 two-floor units constructed of concrete and steel with emphasis on sound abatement and state-of-the-art fire protection. Amenities include: panoramic lake-front, pool views; spacious well-designed floorplans; granite counters and tile flooring; expansive private terraces; large parking area; private elevators; pool and outdoor barbecue areas. For more information about Put-in-Bay Condos, visit Put-in-Bay Condos’ website at www.PutinbayCondos.com or phone 216.898.1105 or via email at reserve@putinbayreservations.com. PUT-IN-BAY – People often think of Put-In-Bay for the partying and weekend revelry, but there is another side to island life that most don’t usually get to see – the local and community philanthropy. Thanks to 11-year-old McKenna Stacy of Put-in-Bay, the Island Safe Harbor Animal Sanctuary in Port Clinton was able to provide medical care for a few more dogs after Stacy donated $1,290 to the sanctuary. McKenna raised the money through the sale of bracelets that read, “Stop the abuse! Love your pets!” She came up with the idea for the fundraiser when she was brainstorming with her mother, Kristi Stacy, for story ideas for the Put-in-Bay Gazette. McKenna purchased the bracelets online and sold them for $5 each during the island’s off-season, when few people inhabit the island. No one expected her to raise over $1,000. McKenna was grateful and surprised by the amount of help she received for the project. Her grandfather sold them for her at the DynaGard gas station he owns on the island. The Put-in-Bay fire department allowed her to sell them at two pancake breakfasts, and many strangers reached out to help. The youth’s newspaper story spurred mail order sales, as did an announcement on the sanctuary’s Facebook page. Kristi was surprised by and very proud of how much money her daughter raised for the sanctuary. Benevento-Brown was very grateful for the donation. Each summer from April through October, hundreds of thousands of visitors travel to Put-in-Bay, Ohio. Put-in-Bay is a small village on South Bass Island which is 13 miles off the shore of Port Clinton, Ohio. It is commonly referred to as the Key West of the North. April is popular for fishermen, May to September is great for summer vacations, and October provides a quiet scenic romantic end to the season. Many people discover Put-in-Bay by chance as a local staycation and others stumble upon it via the ever popular “Put-in-Bay Days” weekend in Key West FL. Many of the regular island entertainers head south to perform at Sloppy Joe’s such as Pete & Wayne, Pay Dailey, Mike “Mad Dog” Adams, Ray Fogg, and Bobby Gatewood. Their loyal and devoted following travels down each year in February for a week of fun in the sun while Put-in-Bay is closed for the winter. If you’ve ever been to Key West, most people can sum up their attraction to Put-in-Bay in a few words: best lobster bisque and Lake Erie perch and walleye ever; mopeds and golf carts for transportation; the “longest bar in the world”; great live entertainment at a dozen restaurants all day and night long; great people watching! But Put-in-Bay is more than that. It is also the site of the greatest naval battle during the war of 1812. The battle between the U.S. Navy, commanded by Commodore Oliver Hazard Perry, and the British squadron, led by Commander Robert Heriot Barclay, could be observed unfolding from the shore of South Bass Island. The pitch battle between six British and nine American warships lasted for hours. During the battle, most of the senior officers (except for Perry) on both sides were either killed or maimed. More than half of the ships engaged were either sunk or disabled. The 352-foot monument — the world’s most massive Doric column — was constructed from 1912 to 1915 “to inculcate the lessons of international peace by arbitration and disarmament.” The monument is taller than the Statue of Liberty. The observation platform offers a stunning view of Lake Erie and a chain of islands in the lake and is accessible by elevator. Recently, a bolt of lightning struck the top of the monument and caused the elevator to malfunction, shutting it down for a couple weeks, but luckily everything has been fixed and reopened as of Saturday, August 6, 2016. During the dedication ceremony in 1915, the multistate commission responsible for the construction stated, “The monument was established to honor those who fought in the Battle of Lake Erie during the War of 1812, and to celebrate the long-lasting peace among Britain, Canada and the U.S.” The monument is situated five miles from the longest undefended border in the world. Vintage Sports Car Racers Return to Put-in-Bay – AUGUST 28-31, 2016! Put-in-Bay, Ohio — The Put-in-Bay Road Races Reunion for the eighth straight year will again wake up the residents of sleepy South Bass Island (off Ohio’s North Coast near Sandusky, OH) with the sights, sounds and smells of vintage sports cars roaring through its quaint streets and around its airport, much the same as it was on the island for one weekend a year back in the 1950s and early ‘60s. This year’s event takes place from Monday, August 29 to Wednesday, August 31. Unlike most vintage racing events, the Put-in-Bay Road Races Reunion (PIBRRR) welcomes owner-drivers of qualified racing and non-racing vintage sports cars of all types to be part of the show and participate in various events and activities. Those activities revolve around vintage racing generally but racing is just part of what’s going on. Of course the racing is very cool since it’s generally for the types of cars that raced at Put-in-Bay back in the 1950s: closed-wheel, small bore sports cars, sedans and sports racers – Triumph, MG, Alfa Romeo, Porsche, Morgan, Lotus, Elva and many others. This year the organizers are also expecting a significant turnout of specified open wheel cars. Drivers of vintage Formula Vees and Formula Jrs have been invited to come experience PIBRRR’s surprisingly challenging airport circuit and are offered both a reduced pre-July 1 entry rate and a separate race group. Sunday, August 28 – Registration opens. Welcome wine and cheese party at Put-in-Bay Winery. Monday, August 29 – Morning focuses on PIB Road Races History featuring historic PIB racing presentations and guests. Racing orientation and practice sessions commence at the airport after lunch (1 – 5 PM), followed by late afternoon laps of the original course (about 6 PM, ATTENTION! — normal traffic and pedestrians will be diverted off the connecting sections of Delaware Ave., Toledo Ave., Langram Rd., Meechen Rd. and Catawba Ave. while this tour takes place). Rocker cover races follow tour of old course (6:30 – 7:30 PM at The Goat Restaurant). 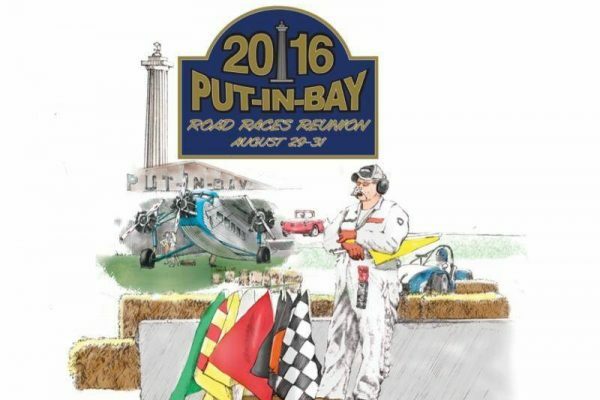 Tuesday, August 30 – Race Day 2 at the Put-in-Bay airport (10 AM – 5 PM)! Featuring qualifying races in the morning, track “Lunch Lapping” for Street Car participants, followed by feature races and the Put-In-Bay Cup race. Racing awards party following the on-track activities. Wednesday, August 31 – Vintage Car Show Day, followed by farewell luncheon and car show awards presentation including presentation of The Paul Henry Award (8:30 – 11 AM, located at the field opposite the Bay Shore Inn). There is always something exciting at Put-In-Bay during the summer. Here is a list of some fun family-friendly activities that are coming up in a few weeks. Plan your island getaway today, bring the kids, and have a great relaxed week on the Bay! Info: Intro to Nature Camp (4 year olds) and My First Nature Camp (5-6 year olds) introduces young children to the world around them with a nature story, a hands-on nature activity, a craft, and a physical activity. Registration forms are available at lakeerieislandswildlife.com or email leinwc@gmail.com. For more details, call Jackie Taylor at 419-279-3199. Nature Camps at the Bay are sponsored by the Lake Erie Islands Nature & Wildlife Center, Miller Boat Line, the Put-in-Bay Recreation Committee, the Ohio State University Stone Laboratory, and the Lake Erie Islands Conservancy. Info: Tour the South Bass Island Lighthouse for Free and learn about its history on Mondays and Tuesdays from 11:00am-5:00pm. June 20 through August 9. Climb the stairs to take in a great view of Put-in-Bay from the top of the tower, which is listed on the National Register of Historic Places. The grounds are open to the public dawn to dusk free of charge and the lighthouse and grounds are also available for rental for private parties and special events. Call 419-285-1800 for more information and pricing. Info: The Lake Erie Islands Nature and Wildlife Center is excited to announce the continuation of our WILD Tuesday! Programs begin Tuesday, June 14, from 1:00 pm – 3:00 pm. The programs will continue every Tuesday thereafter (same time) through August 16. This program is FREE! Although your donations are appreciated and help us to bring in our special guests. Brought to you by the Lake Erie Islands Nature and Wildlife Center, the Lake Erie Islands Conservancy, Miller Boat Line and the Ohio State Univerity Stone Laboratory. So come out, bring the kids, and get WILD in a good way at Put-in-Bay. Lizards with Joseph Byrnes. Do we have lizards on the island? Come find out! Live animals for an up-close and hands-on experience. Info: Creative Embroidery in a Fabric Box Workshop by Sue Gerbick. TIME: 9:00 am to 3:00 pm with an hour for lunch. Learn to make yo-yo’s and fabric flowers to adorn a pre-cut and sewn fabric box. You will also learn different embroidery stitches to add to items in your box. A Progressive Class in the Art of Acrylic and Watercolor Painting by Janet Stearns. TIME: 6:00 pm to 9:00 pm. You will continue to learn different techniques as you create something new or work on a current project. Janet will guide you in the creation of your art piece. Info: Put-in-Bay Town Hall and the American Red Cross are hosting an upcoming blood drive. Please join this lifesaving mission and schedule an appointment today! Coordinator Name: Mike Roe. The Red Cross is in urgent need of blood! Please take the time to give blood and help save a life. During the summer months our hospitals get very low on blood supply and we need your help to keep them supplied. Thank you for taking the time to give blood. The need for blood is constant and only volunteer donors can fulfill that need for patients in our community. Nationwide, someone needs a unit of blood every 2 to 3 seconds and most of us will need blood in our lifetime. Thank you for supporting the American Red Cross blood program! Info: Have you ever wondered what kind of research goes on at Ohio State University’s Stone Laboratory? Want to see Cooke Castle? Science and History Tours of Gibraltar Island will be held each Wednesday, June 22 through August 10 from 11:00 a.m. to 1:00 p.m. A tour fee of $10 ($5 for children 6-12) supports Stone Lab student scholarships. To get to Gibraltar, meet at the Boardwalk Restaurant Harbor Taxi Landing, 341 Bayview Ave. Put-in-Bay, Ohio at 10:45 a.m. to catch a water taxi at a cost of $6 round trip, payable to the boat driver. Tour guides lead a walking tour of the island, including Perry’s Lookout, the glacial grooves, Stone Lab buildings, and the outside of Cooke Castle. The second hour will focus on the Lake Erie research currently being conducted at Stone Lab. Tours are provided on a first-come, first-served basis, with a maximum of 70 people. You can also schedule a tour April through November by calling the Stone Lab Office at 419-285-1800. 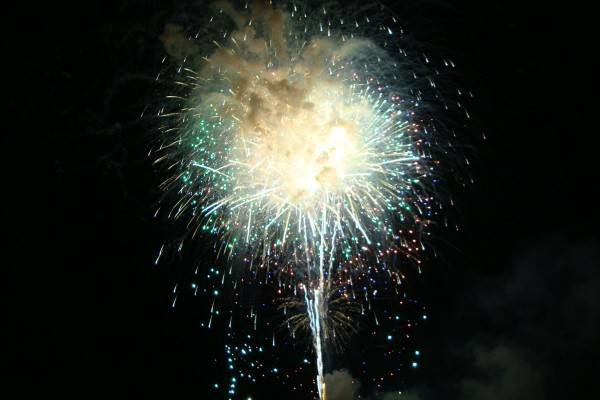 Exciting Put-In-Bay Events, Fireworks and Christmas! Info: This years July 4th includes a freedom concert presented by Perry’s Victory and International Peace Memorial by Jamison Charles and the Flying J’s starting around 7:30 on the lower plaza of the Monument. There will also be General George Patton’s Schooner “When and If” that will be doing day sails from the public docks. A grand fireworks program will also be presented at dark, on the Fourth of July, by the Put-in-Bay Business Owners & Friends of the Bay. The aerial display will be shot off a barge in the downtown harbor and is best viewed anywhere along the downtown waterfront and from Perry’s Victory and International Peace Memorial grounds. Info: “Christmas in July” themed weekend. Some businesses decorate for the Christmas holiday. This is the busiest weekend on the island every year and lodging is booked quickly so make your reservations early. Go to www.visitputinbay.com for Island Lodging information. Jet Express is hosting “Will’s Day at the Bay” to raise money for families affected by Spinal Muscular Atrophy (SMA). 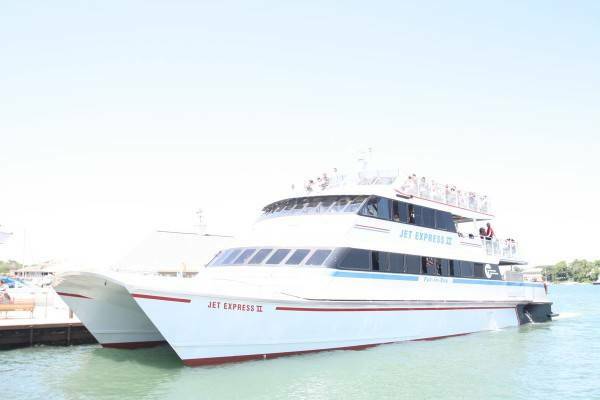 On Wednesday, June 8, round-trip Jet Express tickets from Port Clinton to Put-in-Bay will be available for a minimum donation of $9.00 from 8AM-11AM (or until 600 tickets are sold). Jet Express will donate 100% of proceeds to Cure SMA and Will’s Playground at DeRivera Park in Put-in-Bay. The tickets must be purchased at the Port Clinton dock and must be used on Wednesday, June 8. SMA is a motor neuron disease that affects activities such as crawling, walking, and swallowing. It is relatively common for a “rare disorder,” affecting roughly 1 in 6000 babies; about 1 in 40 people carry the SMA gene. SMA is always fatal in children. Please come out and enjoy a day on Put-in-Bay, while raising funds for this worthy cause. Tickets go fast, so it is advised to arrive early. Together we can help #CureSMA! Putinbay, Nicknamed the “Key West of the North” offers an exciting nightlife with live musical entertainment to satisfy all generations. Strolling Barbershop singers, bagpipers, steel drums and Ohio’s best entertainers (such as Pat Dailey and Mike “Mad Dog” Adams) are frequently seen on Put-in-Bay island. Explore putinbayonline.com and be sure to register for our free Put-in-Bay weekend giveaway and monthly newsletter via e-mail where we keep you informed of Put-in-Bay island events. Info: Islanders and island business owners are cleaning out what they no longer need and offering to shoppers for a bargain. This annual island wide garage sale has become an exciting attraction! To have your address on the free map, contact the Put-in-Bay Chamber of Commerce at 419-285-2832, no later than Tuesday, May 17th. The map will be sent to print on May 19th and available on Friday afternoon, May 20th at the following locations: The Put-in-Bay Chamber of Commerce, the Depot, Miller Boat Line and the Jet Express, and several island restaurants that serve breakfast. We don’t set the hours for the garage sale, but look for most sellers to start around 10 and wrap up by 5 pm or earlier. Info: Perry’s Victory & International Peace Memorial, commemorating two centuries of peace between the United States, Canada and Great Britain, opens for the season today. The memorial and the visitor center are open 10 am to 6 pm daily through October. Downtown Retail Merchants and island home owners join together for one big Island Wide Garage Sale on Saturday. Map with locations for garage sales will be distributed the day of the event. Don’t miss the big bargains at the Heritage Resale Shop at the Historical Museum. Info: The Put-in-Bay Garden Club needs your help for the annual planting and hanging of the Lamppost Flower baskets. The garden club will be doing this both May 24th and 25th starting at 9am. They will meet in DeRivera Park across from the Round House. Info: Perry’s Victory & International Peace Memorial will salute American veterans during the annual “Salute to the Troops” on the memorial grounds on Monday, May 30th. On Sunday and Memorial Day the antique cars will parade through downtown Put-in-Bay, around DeRivera Park at 2:15 pm. 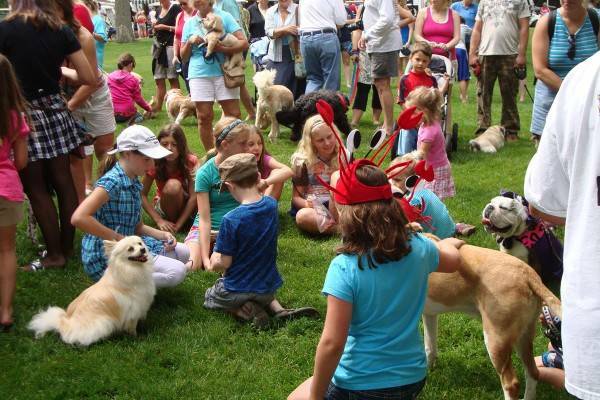 Info: The 11th Annual Island Pooch Parade will be held Saturday June 11 in DeRivera Park. Dogs of all kinds and sizes are encouraged to bring their owners and participate. Registration for this amusing fun event will open in the Park Gazebo at 10 AM., followed by the children led traditional doggie stroll around the Park at 10:30. Judging will immediately follow the parade. The $10 entry fee makes your closest friend eligible to receive a “doggie goodie bag” plus becoming qualified to compete for prizes in one or more of the following groups. The Judges will look for the best pet in these categories: smallest, largest, most talented, individual best dressed, group best dressed, dog that looks most like its owner. Diane Nemec and Noreen Hahn are once again Co-chairpersons They’ll organize the event with the help of doggone good Lenny Brodnik as “emcee”. Lenny does a great job keeping the audience entertained while the judges ponder the pooches. A number of volunteers will assist the chairpersons to assure a smooth, fast paced affair with no “paws”. This is always an enjoyable and entertaining event for the whole island and particularly the children. Put it on your calendar and we’ll see you June 11th. Bring your dog and win a prize. Registration 10 a.m. in the Gazebo, DeRivera Park. Great fun for all the family, especially kids. Cats are NOT invited. Info: A community celebration, the anniversary of the founding of Put-in-Bay by Hispanic merchant Jose DeRivera St. Jurgo is June 12th . Sandwiches, hot dogs, strawberry shortcake, festival vendors, great bargains, live music and lots of fun in the tent and outside in DeRivera Park downtown, 11 a.m. to 4 p.m. This year join the American Red Cross is bringing the ERV to promote their smoke detector safety project, Liberty Air Museums “Lake Erie War Birds” trailer (Ford Tri-motor Heritage) and a WWII jeep. Put-in-Bay’s EMTs, and hand out safety information. A variety of kids games with prizes for everyone. Put-in-Bay’s Volunteer Fire Department sells brats and hot dogs, St. Paul’s Episcopal Church sells strawberry shortcake. Find a bargain at the sale tables, pick up a vintage Put-in-Bay souvenir, handcrafted items, tee-shirts, jewelry and more. Pick up information on activities sponsored by local organizations, including the Lake Erie Islands Historical Society, the Lake Erie Islands Conservancy, Lake Erie Nature and Wildlife Center, the Perry Group (Friends of Perry’s Victory), the Put-in-Bay Swim and Sail, and the Put-in-Bay Garden Club. Info: See what makes Put-in-Bay such a fun port of call for the entire family as we welcome the US Brig Niagara for the 2nd Annual Put-in-Bay Maritime Celebration. The Niagara’s visit is sponsored by the Put-in-Bay Jet Express, Lake Erie Shores & Islands and the Put-in-Bay Chamber of Commerce. 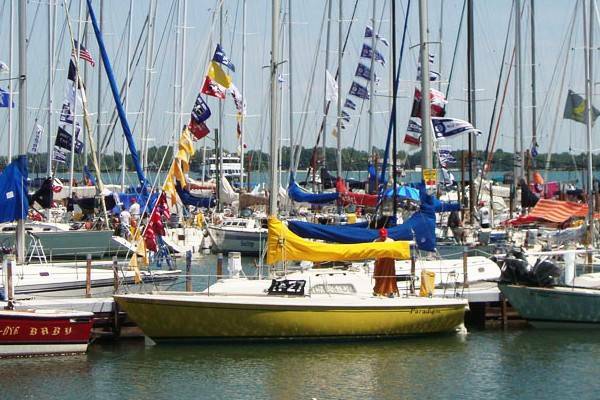 This year the Put-in-Bay Maritime Celebration will be held June 17-20 and will encompass the visit of the US Brig Niagara as well as Put-in-Bay’s Pyrate Fest VIII, and educational and public service programs. 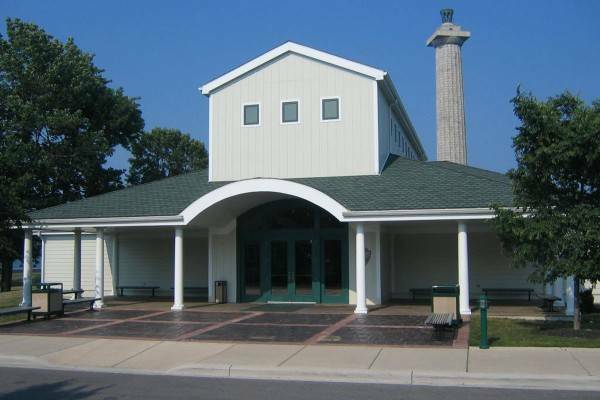 The Put-in-Bay Chamber of Commerce is hosting the Maritime event in partnership with the Perry Group, the Lake Erie Islands Historical Museum, and Perry’s Victory & International Peace Memorial. The Niagara is scheduled to arrive on Friday, June 17, weather permitting, and will offer dockside tours on Saturday and Sunday from 11am to 7pm. Tickets can be purchased at Fox’s Dock where Niagara is berthed. Tickets are available for a Day Sail aboard Niagara, from 1 to 5pm on Monday, June 20. To buy tickets go to http://www.brownpapertickets.com/event/2506228. Tickets are $100 per person. This is a hands on sail experience for ages 12 yrs and up. PUT-IN-BAY — The NFL Draft Day is now behind us and the Cleveland Browns are looking forward to a great rebuilding season with some top-notch draft picks! Put-in-Bay even has its own special group to cheer on and support the Browns. 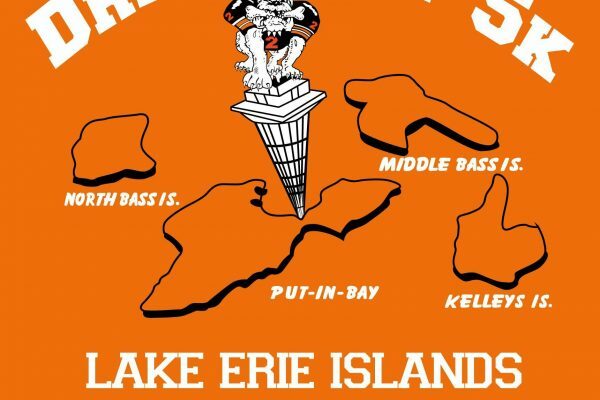 The Lake Erie Islands Browns Backers, headquarted on Put-in-Bay Ohio, spends all year raising money for the local community as well as cheering on the Browns. This year’s fundraising started with the 2nd Annual Draft Day 5k on April 30th this past weekend. Every participant received an Official Draft Day 5k Jersey, free lunch, drink discounts, and tickets into a raffle for Cleveland Browns autographed footballs, framed and signed pictures and more! This event benefited the Lake Erie Islands Browns Backers and everyone’s support of this race was greatly appreciated as all proceeds from the race will go directly to the Lake Erie Islands Browns Backers. The main events are usually held at the club’s official headquarters, Tippers Restaurant & Lounge. The club was named 2007 Club of the Year by the Cleveland Browns as well as being club of the month numerous times. The club’s biggest fundraiser, the Lake Erie Islands Browns Backers Rib Burn Off, was held for many many years at Put-in-Bay. Featured celebrities who participated include: The Bone Lady, Big Dawg, Mobile Dawg, Charlies Fryes, and The Brownie Elf. This event always had live music, Browns players, and some of the best ribs on the island competing for the coveted first prize. Tailgate parties are planned every Sunday during football season. Island businesses will have their establishments decorated with their favorite team colors and theme on the special “Tailgate Weekend”. Our club will be at our home bar, Tippers, on Saturday September 28 selling special event t-shirts, 50/50 raffle and game board squares. For the past few years, the club has maintained its own scholarship for the local high school with $1,000 going to one student for their first year of college. Since its inception in 2001, the Lake Erie Islands Browns Backers has been dedicated to supporting the local community and the love of the Browns. Round 1: Pick 15: Corey Coleman (WR) Baylor University. Round 2: Pick 32: Emmanuel Ogbah (DL) Oklahoma State. Round 3: Pick 65: Carl Nassib (DT) Penn State. Round 3: Pick 76: Shon Coleman (OT) Auburn University. Round 3: Pick 93: Cody Kessler (QB) USC. Round 4: Pick 99: Joe Schobert (LB) Wisconsin. Round 4: Pick 114: Ricardo Louis (WR) Auburn University. Round 4: Pick 129: Derrick Kindred (DB) TCU. Round 4: Pick 138: Seth DeValve (TE) Princeton. Round 5: Pick 154: Jordan Payton (WR) UCLA. Round 5: Pick 186: Spencer Drango (OT) Baylor University. Round 5: Pick 172: Rashard Higgins (WR) Colorado State. Round 5: Pick 173: Trey Caldwell (DB) University of Louisiana-Monroe. Round 7: Pick 223: Scooby Wright III (LB) Arizona. If you read our last review of Mr. Ed’s, you know that this is one of our favorite hangouts on Put-in-Bay. So it was with mild trepidation that we heard that they had completely remodeled their menu for this year and invited us in for lunch. We were lucky to show up the day they were practicing and finalizing their new menu items and got an insider peek at the new food. We’ve never left hungry before, and this trip was no exception! The burger section of the menu is almost completely the same, luckily, but with one burger missing. The theme this year is based around their Big Chubby burger. This is the platform for all of the other burger creations, of which there are many. Past offerings ranged from adding pulled pork, to bologna, to onion rings, to chorizo. Our favorite last year was the chorizo burger. It’s official name was “The Spanish Sunrise Burger” and you may ask why such a goofy name. Chorizo (spanish) and a fried egg (sunrise) are featured, so it made more sense after you saw it. Back to the beginning… this is your platform Big Chubby burger to which they have added chorizo, albeit not a super spicy blend. It is all about the chorizo flavor and not the heat, fortunately (tastes great!) and unfortunately (I like it hot hot hot!). The burger is topped with some pepper jack cheese and a fried egg on top of that to get the cheese melty. Top this off with some spicy slaw, green chilis, and southwest sauce and you have your burger! It was a little pricey at $11.49 but trust me, it was well worth it. So what did they find to replace it? What could fill those Mexican shoes and deliver a flavor profile that is unique and exciting? Enter the Balsamic & Blue Burger ($10.99). You may have seen similar black and blue burgers offered up at Red Robin or one of the other big chains. And yeah, they are usually decent for chain burgers. But here at Mr. Ed’s, they don’t stop at the black and blue… no sir… they add some yellow and red and purple and kick it up a notch. This starts off again as your base Big Chubby Burger (black angus), and they pile on a healthy portion of Blue Cheese Crumbles (blue), Sauteed Onion (yellow), Bacon (red), and a gooey thick yummy mouth-watering Balsamic Glaze (purple). This is a good choice for your burger needs this summer! Next up was the Killer Club ($9.49). Mr. Ed’s has been offering this classic for years and there was a near revolt when it was hinted to be leaving the menu! This baby was stacked high with all sorts of goodies… turkey, ham, bacon, Swiss cheese, American cheese, lettuce, tomato… all squeezed in between 3 slices of wheat bread. Club sandwiches are a classic staple of country clubs and restaurants across the country. Heck, this esteemed reviewer grew up eating them with his grandma on Sunday afternoons at the Bloomfield Hills Country Club and lazy drunken afternoons in Las Vegas (no grandma in Vegas, sorry Gramms!). I know my clubs! This one is pretty good. This club won’t take you outside, kick you in the pants, and make you go wow… but it will fill you up and not leave you hungry, and that is important. There is a fine line in this gastronomic life between the horrendously expensive cost of food-industry bacon, and putting enough on a sandwich to satisfy our bacon-loving public. Personal opinion… this club could use more bacon! That’s about the only demerit we can give since it was so abundant in other ingredients. Would go great with soup! The manager explained the next dish to us and we had to argue about who was going to try it. This was the Pulled Pork Mac & Cheese ($9.49). Just the way it was described was enough to make us want to dig in. When it was served, it was a beauty to behold, a big bowl of white cheddar & shells style mac & cheese with a healthy portion of pulled pork on top. It may sound like an odd combination, but I dare you to try to put your fork down after having a bite. The sweet smokey meaty pork married perfectly to the creamy cheesey mac-n-cheese goodness. Truly something you would usually only see on “Diners, Drive-Ins, & Dives”. The porky-cheese was so good, in fact, that those of us who didn’t order it got a side order ($3.99) to munch on with our main meal!!! It was a perfect accompaniment to the burger and sandwiches that the rest of us ate. It was also a nice change of pace from the traditional french fries (hand cut and house fried). I don’t think any other restaurant on the island has a dish quite like this, so it is highly recommended to stop by Mr. Ed’s and give it a try. If you don’t like it, tell them to leave it in the kitchen for me to scarf up next time I’m in! Another new offering at Mr. Ed’s that didn’t make it to this year is the Pastrami & Rye Sandwich ($8.99). I was bummed out that it didn’t make the grade this year. The pastrami was layered tall on marbled rye bread and just enough sliced gouda was on top to bring some flavor to the table. Layer on some slaw for a little crunch and you had yourself a delicious sandwich. Maybe it needed a little somethin-somethin to get it wet and add some zing you ask? No worries! The Crown Royal & Coke reduction dressing that was served on the side came to the rescue. This wasn’t just a crown and coke splashed into a cup. No sir! This was actually a dressing. They started out back in the kitchen with a big pot of Coca-Cola that they heated up. This was brought up to temp and allowed to reduce down for a couple hours until it was syrupy and sweet and then the Crown was added to taste to give it that wonderful whiskey flavor. The result was a truly unique sauce that will take your pastrami dipping experience to a whole new level. Don’t let your kiddies shoot this sauce! Remember that balsamic glaze that we mentioned for the Balsamic and Blue Burger? What would happen if you tried that on french fries? And not just any french fries… fries that were cut in house every day and fried to order? The result would be the new Chronic Fries ($5.99). They are a little weird, a little unconventional, but that is what you would expect from an island eatery that likes to stand out and offer items that no one else on the island has. Take your Fresh Cut Fries, add on some fresh Parmesan Cheese, splash on a bit of Garlic Butter, and then drizzle with the oooey gooey Balsamic Glaze. Take it to the bank! These are some crazy fries! Unfortunately, they wouldn’t let us try everything, so a return trip this summer just may be warranted, for professional blogging reasons of course! Long time visitors to the island will be pleasantly surprised when they discover the new menu at Mr. Ed’s on their next trip. First time visitors will be wowwed by the level of food quality at what is at first blush a typical bar. The menu here is different than your usual boring island burger/sandwich menus that seem to pervade this island. Fresh thoughts, fresh food, and leaving with a freshly full tummy. Yumm! *SPECIAL NOTE* – Rumor has it they are doing a Bloody Mary Bar on early Saturday mornings (10am) that include screwdrivers and mimosas as well. Check it out! 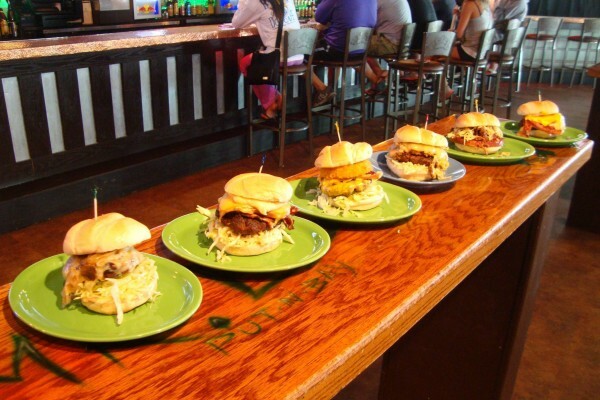 You can reach Mr. Ed’s Bar & Grille by calling 419.285.5042. You also can follow them online at http://www.mredsputinbay.com or on Facebook. #2 — CHECK BACK NEXT WEEK!! !